1Department of Marketing, Institute of High Business Studies of Sousse, University of Sousse, Sousse, Tunisia; 2Faculty of Economic Sciences and Management of Tunis, University of Tunis El Manar, Tunis, Tunisia; 3Faculty of Economic Sciences and Management of Tunis, University of Tunis El Manar, Tunis, Tunisia. Copyright © 2013 Bouzaabia Rym et al. This is an open access article distributed under the Creative Commons Attribution License, which permits unrestricted use, distribution, and reproduction in any medium, provided the original work is properly cited. The emergence and evolution of the Internet have led to the development of useful and powerful tools for distance learning. As a result, e-learning is becoming increasingly important and is making the learning process more effective in many contexts . Education and industry have sought the contribution of e-learning in order to improve their competitivity , financially, socially and organisationally. Finance-wise, e-learning allows for reducing total training costs by eliminating various transportation and accommodation fees which sometimes exceed half of the total costs [3,4]. Organisation-wise, e-learning creates new individual training platforms, favours group training within virtual teams and prepares knowledge management thanks to electronic interactions which reinforce group and cooperative work . Socially speaking, thanks to its permanent and participatory potentials, e-learning may be perceived by employees as a “strong social act that generates in them better behaviour at work” . Despite these advantages, recourse to e-learning is not often accepted by end users. We notice that users are often unwilling to opt for e-learning even if this latter may generate significant increases in productivity . The reasons seem to be subtle and exceed rational decisions traditionally recommended by the economic approach. It would be then interesting to determine the factors that influence the implementation of e-learning among the training practices of Tunisian firms. Understanding determinants of e-learning adoption assumes the analysis of the manner with which trainees perceive, express and use this training technique. Then, our study aims at determining the factors behind accepting e-learning by trainees. To this effect, we use a very well defined model, which is the Technology Acceptance Model (TAM), to conduct an empirical study over 200 employees of the Tunisian Post Office across the different regions of Sfax, Sousse, Tunis, Monastir and Jendouba to test our hypotheses. In the first section, we present the review of the literature. In the second section, we present our research hypotheses. The third section discusses our methodology. Finally, the results of our research are presented and discussed in the last section. E-learning generally refers to methods of learning which use electronic instructional content delivered via the internet and is a term which is synonymous with Webbased or online learning . The widespread proliferation of internet technologies and applications provides incredible opportunities for the delivery of education and training. Moreover, with rapidly increasing internet usage e-learning has now become a portable and flexible new method for learners to gain essential knowledge . Nowadays e-learning is emerging as a new paradigm of modern education, especially for small and mediumsized enterprises . Many empirical studies support the idea that effective e-learning benefits organization success . That is why e-learning plays such an important role in organizational training. E-learning can be classified as asynchronous e-learning or synchronous e-learning [11,12]. First asynchronous e-learning is a form of self-study  commonly facilitated by media such as email and discussion groups; supports work relationships among learners with teachers, even when participants cannot be online at the same time. As such, it is a key component of flexible e-learning . In contrast synchronous e-learning allows for real-time interaction and just-in-time response between instructors and learners  commonly supported by media such as videoconferencing and chat. It has a potential to support e-learners in the development of learning communities . • Ease of learning with better retention: E-learning offers to learners the opportunity of an easy access to relevant and useful knowledge [21-24]). Collins et al. argue from them that “e-learning” enhances information storage rate. • Flexibility of time and place: e-learning gives students the opportunity to attend training at anytime, anywhere ; this is the “Just in time” approach [19,26]. • Customizing e-learning: “e-learning” allow learners to learn according to their individual pace and according to their personal agendas [11,26,27]. • Improving Productivity: E-learning offers opportunities to improve and increase learners’ effectiveness [21,23]. • Interactivity and institution-community collaboration: e-learning binds each learner with other learners and experts together to form a collaborative learning community [11,21,26]. However, these assumptions are not shared by all researchers [28,29] and are dependent on the acceptance of e-learning technologies for learners, which is linked to a number of contextual factors. The technology acceptance model was introduced by Davis  as an adaptation of the theory of reasoned action to model user acceptance of information systems. Its purpose is to explain the determinants of the acceptance of the use of computers and related technologies in a wide range of technologies and user groups. TAM has been made ​​to trace the impact of external factors on the beliefs, attitudes and intentions by identifying a limited number of variables suggested by previous research regarding the cognitive and emotional determinants of accepting the computer and using TRA as the theoretical foundation for modeling the theoretical relationships between these variables. • Perceived usefulness is “the degree to which a person believes that using a particular system would enhance his job performance” . • Ease of use refers to “the degree to which a person believes that using a particular system would be free of effort” . “According to the TAM, both PU and PEOU influence the attitude of individuals towards the use of a particular technology, while attitude and PU predict the individual’s behavioural intention (BI) to use the technology” . PU is influenced by PEOU, because, other things being equal, the easier a technology is to use, the more useful it will be . “PU is also influenced by PEOU. TAM also suggests that external variables intervene indirectly, influencing both PU and PEOU” . Davis model is presented as the Figure 1 shows. TAM has been the subject of several applications and has been shown to be a significant predictor in a variety of studies. Venkatesh and Davis  examined the impact of gender on the acceptance of technology and have concluded that gender is a fundamental aspect of culture and it can affect the process of technology adoption. Figure 1. Technology acceptance model. Mathieson  compared TAM and theory of planned behaviour and noted that both provide a good explanation of intention. However, while TAM is the easiest to apply, it provides only general information about the views of technology users. Mathieson  postulates that the key concepts of TAM remain insufficient to predict intention to use, and those other variables, equally powerful and meaningful, should be incorporated into the model. Moreover, the fact that TAM in its first version has evaded subjective norms has been criticized. Thompson  showed that the addition of an appropriate social factor increases its predictive value. For their part, Venkatesh and Davis  assume that the first version of TAM lacks pragmatic usefulness because it does not explain the factors of each concept of the model. In this paper an extended model is proposed, based on an extension of the TAM approach. The extended model includes constructs and relationships which may prove to be important in the context of e-learning. These constructs are: Social factors; System factors; Individual factors organizational factors and Voluntariness of use factors. Our research design was inspired by the model of technology acceptance and various extensions and modifications made to this model [15,32,33]. 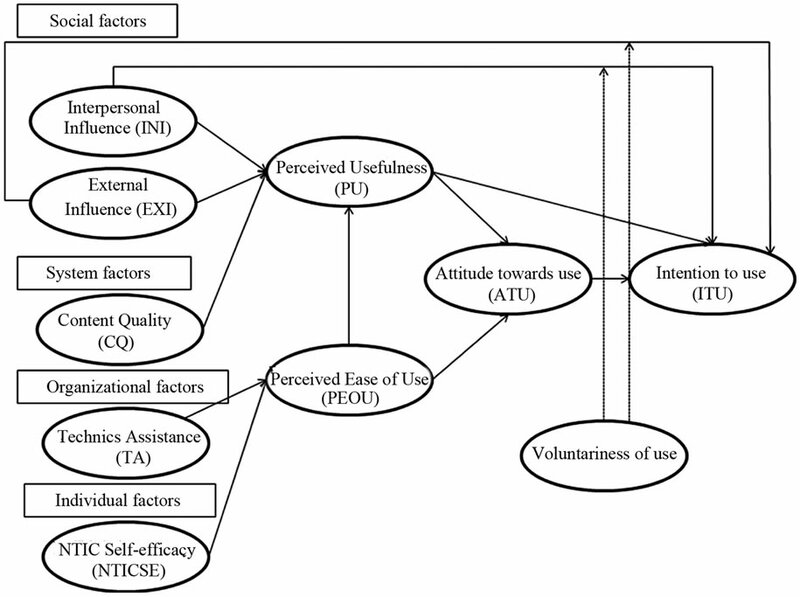 Four types of factors influence usefulness and perceived ease of use of elearning: Social factors (Interpersonal influences and intrapersonal influences), System factors (content quality), organizational factors (technics assistance) and individual factors (NICT self-efficacy). Perceived usefulness jointly reacts with perceived ease of use on attitude toward the use of e-learning. The intended use of e-learning is influenced at the same time by attitude towards this behaviour, by interpersonal influences, and perceived usefulness of e-learning. Finally, voluntariness will have a moderating effect on the relationship between social factors (INI/ EXI) and the intention to use e-learning . Figure 2 shows an operationalization of the extended TAM. Social factors were tested as subjective norms on behaveioural intention [8,36,37]. Subjective norm is defined as ‘the person’s perception that salient social referents think he/she should or should not perform the behaviour in question’ . The referent influence may be the INI (the influence of friends, family members, colleagues, and superiors) [15,38,39] or the EXI (influence of mass media reports, expert opinions and other non-personal information considered by individuals in performing a behaviour . and Hartwick  argue that social factors exert a more significant effect on the intention to use technology in the case of mandatory use than in the case of voluntary use. Since the use of e-learning may be voluntary or mandatory, voluntariness is supposed to moderate the relationship between social factors (INI and EXI) and the intention to use e-learning . In other words, in case the company requires its employees to use electronic training, subjective norms play a more important role on the intended use of the method than in the absence of this requirement. • H1D: voluntariness has a moderating effect on the relationship between an external influence and intention to use e-learning. Accordingly, our research tries to assess employees’ perceptions of the disposal of their organization to provide help and advice when needed to facilitate the use of e-learning. • H2: Technics assistance will positively affect perceived ease of use of an e-learning system. Lee  argues that the content quality in e-learning represents at the same time richness and regular updating of content. The content quality of e-learning is a systemic factor whose positive influence of perceived usefulness of the use of e-learning has been confirmed in several studies [8,15,46]. • H3: Content Quality will positively affect perceived of use of an e-learning system. Mastery of a computer refers to forming judgments of a person’s self-efficacy to use information technology and communication such as computers, the Internet, intranets, extranets, or emails . Bandura  defined self-efficacy as “people’s judgments of their capabilities to organize and execute courses of action required to attain designated types of performances. It is concerned not with the skills one has but with the judgments of what one can do with whatever skills one possesses” (p. 391). In the context of e-learning, several studies have confirmed the positive influence of mastery of new information technology on perceived ease of use [15, 48-50]. • H4: NTIC Self-efficacy will positively affect Perceived ease of use of an e-learning system. We found like Legris et al. and Cheng  that most research confirms the presence of significant positive relationships between perceived usefulness, perceived ease of use, attitude and intention to use e-learning. PU and PEOU directly affect attitude towards using an e-learning system [15,52-54]. PU mediates the influence of PEOU on attitude towards using an e-learning system [15,51-54]. PU directly determines intention to use an e-learning system [8,15,50,52,54-60]. Furthermore, PU mediates the influence of PEOU on intention to use the e-learning system [8,16,48,50,52,55-61]. Finally, attitude towards the use of e-learning positively influences intention to use [15,52]. • H9: Attitude towards using the e-learning system will positively affect the intention to use the system. In this research, we conducted a survey of post office employees whether they are enrolled or not in a virtual school. We chose the Tunisian post office because it is the first Tunisian company that has set up its own virtual school for the benefit of its employees, which would allow them improving their skills and insuring internal promotion within the post. Data collection was conducted using a questionnaire that was administered face to face to 200 postal employees in Tunis, Sousse, Monastir, Sfax and Jendouba. Our sample consists of 200 postal employees including 51% men and 49% women. The age of respondents varied between 20 and 60 years with a higher frequency of 30 to 39 years. The average experience of employees varies between 2 and 5 years. The sample distribution by region is described in Table 1. Table 1. Sample distribution by region. The survey instrument for this study was designed from existing scales in information systems research of TAM. These scales were translated from English to French using the method of the Committee . The questionnaire consists of 31 items and measured by a Likert scale ranging from 5 points “Totally agree” to “Strongly agree.” To ensure the clarity of the items, the questionnaire was pre-tested with twenty employees. No difficulty in understanding the items was observed and therefore no changes have been introduced during the pre-test phase. The final items are listed in Table 2 with their sources. Table 2. Construct measurement and sources. To purify and assess the dimensionality of the scales, we conducted a principal components analysis (PCA) with a varimax rotation. Two items were eliminated (NTICSE4 and CQ1). These are the items with low factor loadings and whose communalities are less than 0.5. All items that we have retained have factor loadings greater than 0.6. 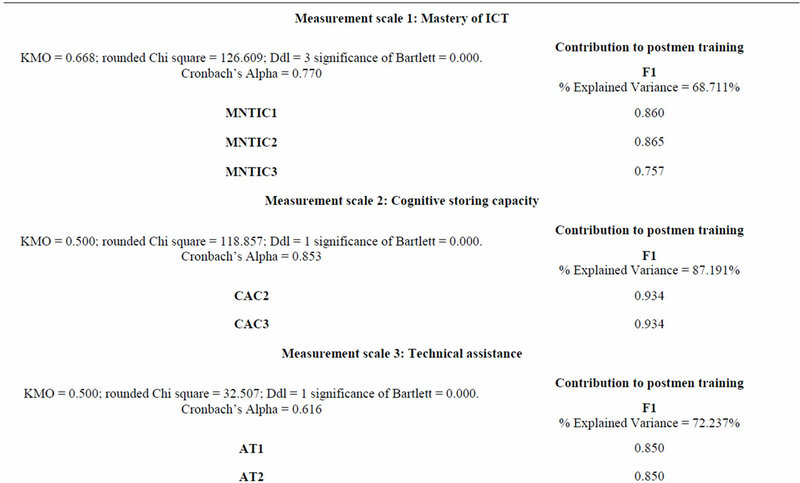 All our measurement scales are reliable with satisfying Cronbach’s alpha coefficients ranging between 0.7 and 0.85. The appendix provides a summary of the main results of the exploratory analysis (Appendix 1). In a second phase, we conducted a confirmatory factor analysis on AMOS 18.0 to test the reliability and validity of each measurement scale (Appendix 2). The results of the estimation of the structural equation model of the measurement model show that convergent validity is satisfactory (ρvc > 0.5). Similarly, all factor loadings are significant (CR > 1.96) and greater than 0.6. The set of values ​​of the coefficients of multiple determinations are good. Jöreskog rho was calculated for each variable. All coefficients are above the recommended threshold of 0.7. The methodology adopted to check discriminant validity is to make sure that each concept shares more variance with its items than with other latent variables. Specifically, we conclude that discriminant validity is verified when average variance of the variable X (ρvc of the latent variable) is greater than the square of the correlation between the variable X and the remaining variables. In Table 3, the diagonal figures report the variances shared between constructs and their measurement indicators (ρvc). The rest of the table corresponds to the square of the correlation between different constructs. All coefficients of the squared correlation are less than the average extracted variance. Therefore, discriminate validity is checked. Finally, we tested the goodness of fit of the measurement model. 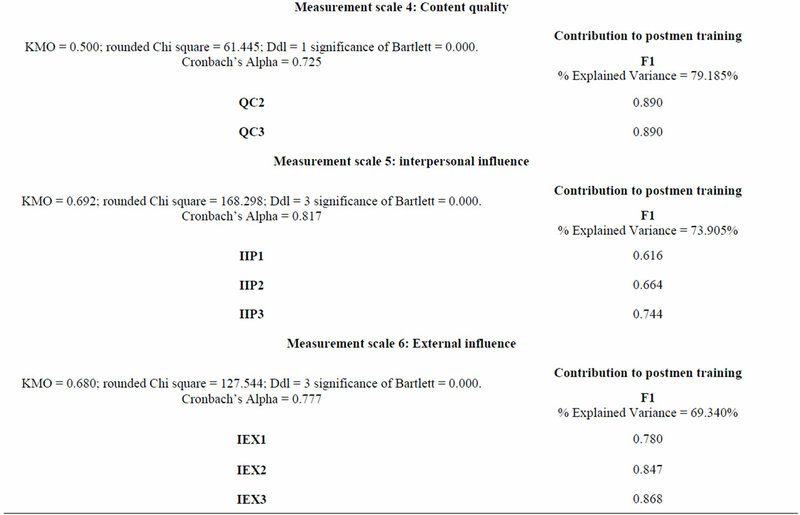 Table 4 shows that the model is satisfactory because all indices have values ​​respecting empirical standards. In fact, the model is parsimonious with a normalized Chi square and a satisfactory BIC index, signifyicant and lower than the index of the saturated model. RMR indices are lower than the empirical threshold 0.8. Finally, absolute GFI and AGFI indices are close to 1 and are acceptable. “Causality” links between variables of the model were analyzed by structural equation models in AMOS 18.0. The structural equation method allowed us to confirm some relationships and to reject others. Each relationship cannot be considered significant when the value of the corresponding CR is smaller than 1.96 in absolute value. The results of the structural modeling analysis are reported in Table 5. Table 3. Discriminant validity of the measurement model. Table 4. Goodness of fit of the model to measure the use of e-learning. Table 5. Results of the structural modeling analysis. A moderating variable is defined as “a qualitative variable (e.g., gender, social class) or quantitative (e.g., level of reward) that affect the direction and/or strength of the relationship between the independent variable and the dependent variable” . The direct link between interpersonal influence and intention to use e-learning is insignificant hence H1C is rejected. • Create an identical model to test for the two samples. • Link each model to its appropriate database. • Create a fixed or constrained model in which we assume that factor loadings for both are the same; and an unconstrained or free variant model in which we assume that the loadings vary by group. • Test the difference in the factor loadings between the two groups. Since our moderating variable is ordinal, we divided it into two groups by transforming this variable into a dichotomous variable using the classification method (dynamic clouds). Ultimately, we have two groups: group 1 e-learning users by requirement and group 2: volunteer e-learning users. Table 6. Segmentation of the sample according to voluntariness level. longs to the first group and 50% belong to the second group. We notice that the unconstrained model has a nonsignificant chi-square coefficient equal to 11.899 with 22 degrees of freedom (p = 0.063 > 0.05), whereas the constrained model has a chi-square coefficient of 28.773 with 17 degrees of freedom which is significant (p = 0.015). The chi-square difference between the free model and the constrained model is significant, p = 0.021 below the 0.05 threshold. Then, we may conclude that voluntaryness moderates the relationship between external influences and intention to use e-learning. At this level, it seems appropriate to consider whether the nature and intensity of the moderating role of volunteerism in the relationship between external influences and intention to use e-learning varies from one group to another. 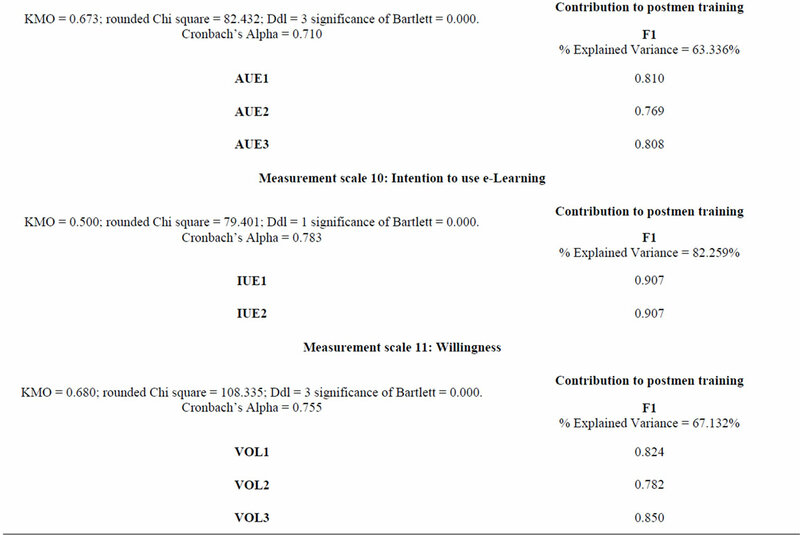 The results are obtained by comparing the standardized coefficients for each of the two groups (Table 7). With reference to Table 7, we may conclude that the moderating impact of volunteerism on the relationship between external influences and intention to use elearning is significant for both groups. Indeed T-Student test is significant and greater than 2 and probability level of the coefficient is less than 5%. However, we notice that the dampening effect of voluntariness is quite intense for the first group. Differently put, the relationship between external influences and intention to use an e-learning system is more intense among employees required by their companies to use elearning. 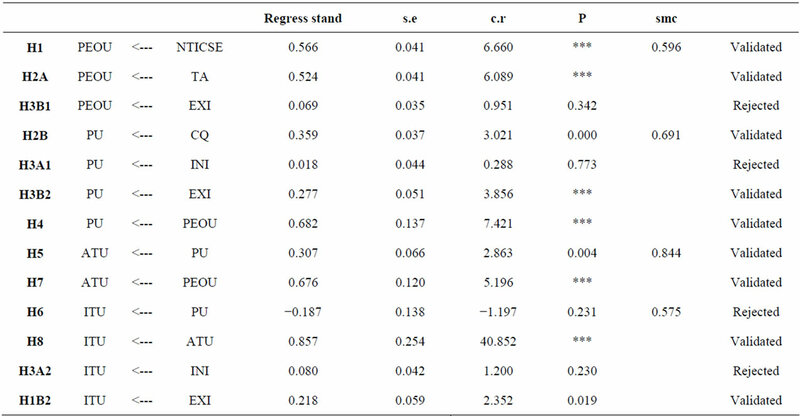 Structural links between perceived ease of use (PEOU) and mastery of new technologies of information and communication (NTICE), and also between perceived ease of use (PEOU) and Technics assistance are proved significant (t = 6.660, 6.089, p = 0.000). Furthermore, these relationships are positive in nature and very close in terms of intensity (g = 0.566 and g = 0.524). Then NTIC self-efficacy (NTICSE) as an individual variable and technics assistance (TA) as an organizational variable appear to be two key factors for the acceptance of e-learning. The results support prior research (e.g. [8,15,48,50,57]). This implies the need for practitioners and human resource managers to conduct training in the use and mastery of current technologies, primarily the use of computers, the Internet and intranets, but also to ensure that they assist their employees by providing them with help and advice. As for social factors, our research finds no significant relationship between interpersonal influences (INI) and intention or perceived usefulness of e-learning (t = 1.2; 0.288; p = 1.2; g = 0.773). This result is consistent with that of Davis et al. and Mathieson  who found no impact of subjective norms on intention. These authors explain that lack of relationship does not mean that subjective norms have no effect, but that this effect can be complex and acts only in some specific situations. Thus, the reference group of a Tunisian employee, composed of his/her colleagues and superiors, appears to have no effect on perceived usefulness of e-learning and his/her intention to use e-learning. were found to positively affect intention to use the system directly (t = 2.352; p = 0.019, g = 0.218) and indirectly via PU (t = 3.856; p = 0.000, g = 0.277) [15,32,37] but has no significant effect on PEOU (t = 0.951; p = 0.342). Likewise, it seems that the direct and positive influence of EXI on intention to use e-learning depends on whether the adoption of the latter is voluntary or mandatory . Indeed, the effect of EXI on intention to use e-learning is more important for Tunisian post office employees whose adoption of e-learning is involuntary. Thus, the Tunisian employee seems to be more sensitive to the opinion of his/her reference group formed by mass media and experts when adopting the system is rather mandatory [15,32,37]. 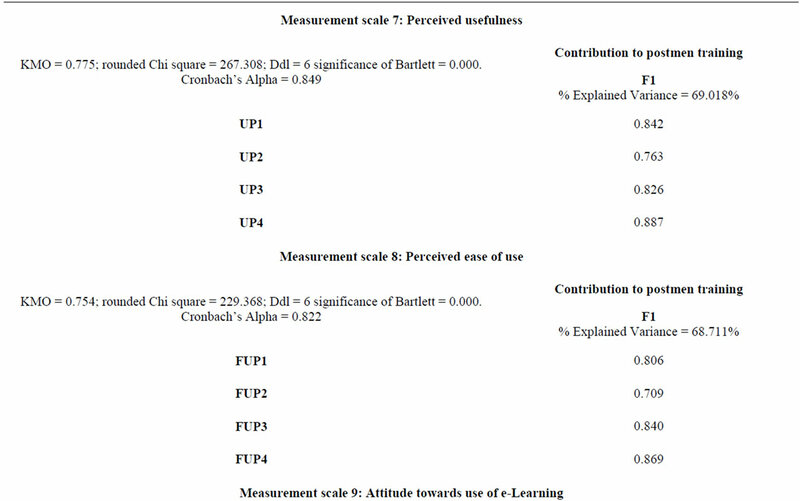 As for system factors, the effect of the content quality of e-learning on perceived usefulness is significant and positive (t = 3.021, p = 0.000), which is consistent with the results of Lee  and Pituch and Lee . In fact, the more the content of e-learning is good-quality, rich and updated regularly, the more perceived usefulness is important [8,46]. Finally, Tunisian employees, attitude towards the use of e-learning (ATU) seem to be a key determinants and very important for its use (g = 0,857) [7,15,70,73-76]. Similarly, our research has shown the importance of the direct positive influence of perceived ease of use of elearning on attitudes towards this latter (t = 5.196; p = 0.000, g = 0.676) but also indirectly through perceived usefulness (t = 7.421; p = 0.000, g = 0.682). Finally, the influence of perceived usefulness on attitude (g = 0307) is less important than perceived ease of use (g = 0676). Our research shows that intention to use e-learning in the Tunisian context depends on the positive attitude of employees towards e-learning. This positive attitude is explained primarily by good perceptions of ease of use and usefulness, second by their perceptions of their ability to master new information technologies (NICT) and Technics assistance (TA) proposed by the company, and finally by the content quality (CQ) of training and extra personal influences (EXI). The moderating role of voluntariness on the relationship between external influences and intention to use e-learning has been confirmed. Indeed, it turns out that this relationship is stronger for employees whose adoption of e-learning is not voluntary than those whose use is voluntary and indicates on the other hand the importance of the three variables. The results of our research confirm that acceptance of e-learning by Tunisian employees depends primarily on their relationship with new information technologies. In fact, their deception is being unable to master the training tool, not to be well assisted at all levels of training and experience difficulties when using the latter. Indeed, elearning in Tunisia is still in its infancy and the Tunisian employee is not yet accustomed to this new form of training without doubting its effectiveness and its importance. On the managerial level, the outcome of this research allows us to make recommendations to training managers to promote the use of e-learning. Thus, we propose that managers should focus on training employees in the use of computer tools in general and Internet and intranet in particular, so that they can develop computer fluency and a strong sense of personal computer efficacy. Particular attention should also be paid to the ease and simplicity of handling e-learning systems on the part of employees. So we encourage managers to establish periodic upgrading sessions in favour of the unit responsible for the administration of e-learning within the company and all those who are able to assist employees, either on a technical level or by advice and use instructions. Moreover, we suggest that managers continuously improve the quality of training content, as the incorporation of pleasure in learning content presents the greatest challenge to instructors who do not have sufficient computer skills . This study has limitations that should be noted and addressed in all future research. This study was limited to the sector of the Tunisian post office. Given the limited scope of this study, caution should be taken in generalizing the results. Indeed, respondents in this study are of Tunisian culture and certainly their cultural beliefs influenced their perceptions, attitudes and intentions. Similarly, it is important to understand how the influence of these factors changes over time with the mastery of the use of e-learning by employees. It would be interesting in future research to integrate cultural variables in the technology acceptance model of e-learning. Variables like, for example, the characteristics of national cultures postulated by Geert Hofstede (individualism, collectivism, masculinity, femininity, power distance and uncertainty avoidance) in order to enrich the study of cultural differences in the use of e-learning. But also a comparative study which highlights the difference of the determinants of e-learning acceptance between developing countries (like Tunisia) and developed countries. It would also be appropriate to conduct a longitudinal study to observe the variation of the evolution of elearning acceptance and usage over time and try to explain it. W. T. Wong and N. T. N. Huang, “The Effect of ELearning System Service Quality and Users’ Acceptance on Organizational Learning,” International Journal of Business and Information, Vol. 6, No. 2, 2011, pp. 205-225. M. Thevenet, “Approches de la Formation Continue en Entreprise,” Revue Française de Gestion, Vol. 54, No. 65-66, 1987, pp. 61-69. W. Minhong, “Integrating Organizational, Social, and Individual Perspectives in Web 2.0-Based Workplace ELearning,” Information Systems Frontiers, Vol. 13, No. 2, 2009, pp. 191-252. M. Favier, M. Kalika and J. Trahand, “E-Learning/EFormation: Implication Pour les Organisations,” Systèmes d’Information et Management, Vol. 9, No. 4, 2004, pp. 55-65. T. Lassouad, “Les Déterminants de L’adoption de L’eleaning: Etude Empirique au Sein de L’entreprise Tunisienne,” Ph.D. Dissertation, Université Jean Moulin Lyon 3, France, 2010. L. G. Vallerand, “Vers une Methodologie de Validation Transculturelles des Questionnaires Psychologiques: Implications Pour la Recherche en Langue Française,” Psychologie Canadienne, Vol. 30, No. 4, 1989, pp. 662-680.